If you are looking for a local locksmith who is transparent on price, trusted, reliable and has a high standard of workmanship, then Stuart Rock from Rocks Locks in Camberley is the locksmith you need to call. Stuart has gained a strong reputation for his commitment to providing high levels of service to his customers in Sunningdale and the local area. You may have come across a few locksmiths in the local area, but we hope you will choose Rocks Locks in Camberley. Rocks Locks Locksmith Services may be a little bit further away than some local locksmiths, but we don't charge extra for the distance travelled and we are happy to serve customers in Sunningdale, as it is just a few miles down the A30 from Rocks Lock's base in Blackwater, near Camberley Surrey. 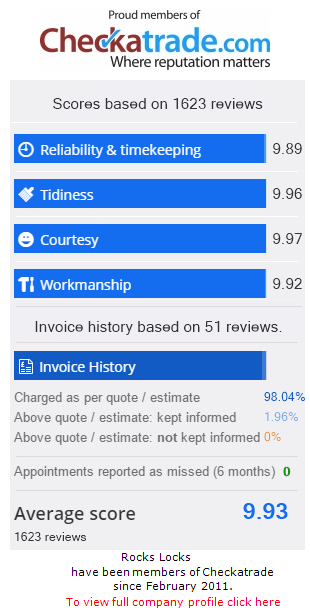 With so many local customers willing to leave such lovely feedback on Checkatrade, Rocks Locks hopes this reassures you of the commitment to providing a locksmith service that goes beyond your expectations. Home security must be taken seriously, and Stuart, your local locksmith, will ensure that your home is safe and secure. If you are looking to upgrade your current locks and security then can advise on the options available that will suit your needs and budget. Stuart also offers window and door repairs, specialising in uPVC windows, and will supply and fit traditional locks for period properties if required. Prices available upon request. Stuart can provide a fast and efficient response should you require an Emergency Locksmith due to being locked out of your home or business premises. Rocks Locks Locksmith services include fast emergency response, lock repairs, replacement locks, door entry systems, installing safes, window and door replacement, installation of alarms and CCTV, insurance claim survey reports and security advice.